In the second series of the acclaimed “Teens in the Wild”, Clinical psychologist David Coleman takes a group of six troubled teenage girls on a 21 day wilderness activities and therapy course. This time, in the wilds of Donegal, he works with girls, aged 14-17, who are struggling with issues including anger management, bereavement, separation and problems at school – all of which have resulted in strained relations with their parents who are at breaking point. 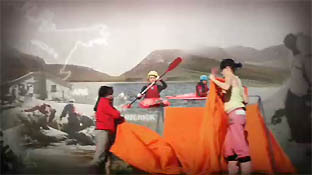 For three weeks, the girls live in an isolated cabin (under the supervision of the Gartan OEC instructors) on the perimeter of Glenveagh National Park. Far removed from the usual teenage temptations and distractions, David’s hope is that the girls focus on their issues and work through them with him, giving them the opportunity to start making some positive change in their lives. During the three-week course, David invites the parents to a separate wilderness location in Donegal to explore with him, what possible reasons may lie at the root of their teen’s misbehaviour. These intense ‘sessions’ also help the parents to realise that they too need to be open to change. TV Now Award nominee 2010.